Although Carol Berg majored in mathematics at Rice University, so she wouldn’t have to write papers, she took every English course that listed novels on the syllabus, just so she would have time to keep reading. And it was her college roommate who shared a dog-eared copy of Tolkien and a love for fantasy that changed Carol’s life… eventually. Somewhere in the midst of raising three sons, earning another degree — this time in computer science — and a software engineering career, another friend teased her into exchanging letters written “in character.” The game quickly got out of hand. Carol’s mythic fantasy novels have earned the Geffen Award, the Prism Award, multiple Colorado Book Awards, and the 2009 Mythopoeic Fantasy Award for Adult Literature. She lives in Colorado at the foot of the Rocky Mountains. Find excerpts, pronunciation guides, and other information at Carol Berg’s website. The Bridge of D’Arnath — (2004-2005) Publisher: In the Four Realms, sorcery is persecuted with a thoroughness that recalls the Third Reich, and Leiran noblewoman Seri has gone into exile to avoid not only that but also the faction fights of the royal family. Unfortunately, Leiran soldiers drive a mute, fugitive warrior to seek shelter with her. 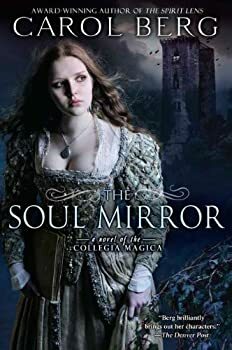 She helps him recover his identity, though as the story progresses, it appears that he may be a mage as well as a warrior, and may prove crucial for dealing with a menace that the Four Realms have brought on themselves by their war against magic. 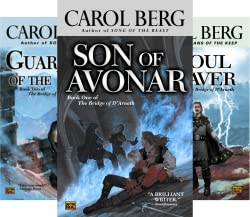 Carol Berg has been one of my favorite authors for years now, ever since I picked up Son of Avonar, having been intrigued by both the title and the cover. 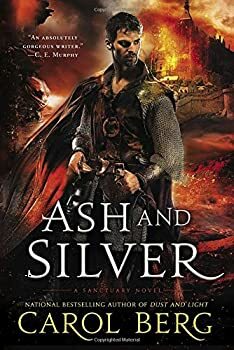 She’s an author who can handle first person point of view with skill (no, it’s not easier, trust me), weaves some truly fascinating plots with excellent twists, and creates interesting worlds peopled by races that feel unique in a genre full of elves, dwarves, and the like. Though she has her occasional disappointments, the quality of her writing is still above and beyond a lot of what can be found on the shelves next to her. The Lighthouse Duet — (2007-2008) Publisher: A stolen book of maps plunges a renegade sorcerer into a world of secret societies, doomsayers, fanatics, princes, and madmen. Yet only in the twilight of myth does he discover the truth of the coming dark age and the glorious, terrible price of the land’s redemption… and his own. The Sanctuary Duet — (2014- 2015) Publisher: National bestselling author Carol Berg returns to the world of her award-winning Flesh and Spirit and Breath and Bone with an all-new tale of magic, mystery, and corruption…. How much must one pay for an hour of youthful folly? The Pureblood Registry accused Lucian de Remeni-Masson of “unseemly involvement with ordinaries,” which meant only that he spoke with a young woman not of his own kind, allowed her to see his face unmasked, worked a bit of magic for her….After that one mistake, Lucian’s grandsire excised half his magic and savage Harrowers massacred his family. Now the Registry has contracted his art to a common coroner. His extraordinary gift for portraiture is restricted to dead ordinaries—beggars or starvelings hauled from the streets. But sketching the truth of dead men’s souls brings unforeseen consequences. Sensations not his own. Truths he cannot possibly know and dares not believe. The coroner calls him a cheat and says he is trying to weasel out of a humiliating contract. The Registry will call him mad—and mad sorcerers are very dangerous…. 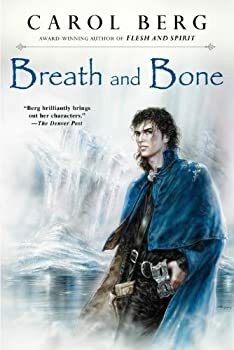 With the second book of The Lighthouse Duet, Breath and Bone, now out, I decided to refresh my memory, as it's been a full year since I last read this one. I can remember being distinctly disappointed with it. Yet after some of what I've read this year (some of it being absolutely awful) I'd have to say my mind has changed somewhat. 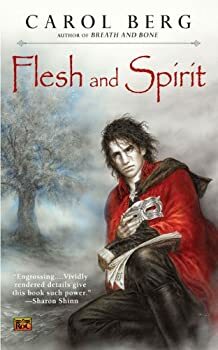 Anyone who's read my review of Flesh and Spirit knows that I was a little bit disappointed in some aspects of the book (I maintain that this is due to the fact that Carol Berg has left me a spoiled, fussy fantasy reader). So how did Ms. Berg do this time around? Dust and Light: You call that an ending? 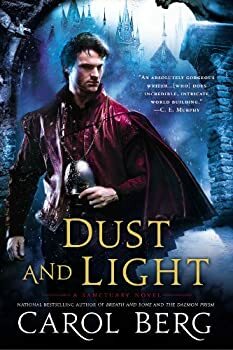 I bought Dust and Light, your latest fantasy novel, because you wrote it, and because I loved the COLLEGIA MAGICA series. I had no idea you were going to do this to me. At the edge of the eastern sea, the Fortress Evenide holds the Order of the Knights of the Ash. Greenshank is a paratus, one level below a knight, and is working day and night to be deemed ready for promotion. Greenshank is completely loyal to the Knights of the Ash, in part because he has to be. He has no memory of any life before two years ago when he was brought to the citadel. Then one day, returning from an assignment, he is accosted by an otherworldly woman, a Danae, and she calls him Lucien de Remeni. Courtiers are figures of contempt and fun in most fiction. They are craven lickspittles and influence peddlers, usually without honor. In The Spirit Lens, Carol Berg gives us a hero who is a true courtier. He is diplomatic, disciplined, strategic and loyal to his king at all costs — and the costs are great. 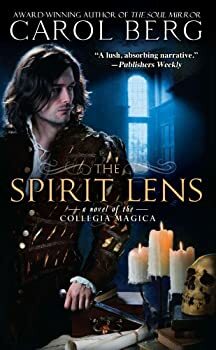 The Spirit Lens is the first book in the Collegia Magica series. Portier de Savin-Duplais is the librarian at the Camarilla Magica. He is a failure. Despite his bloodline and all his studies, Portier cannot do magic. While this personal failure is deeply galling, it may not matter so much in the grand scheme of things, because Sabria, the kingdom that is Portier’s world, is changing, and magic is on the decline. 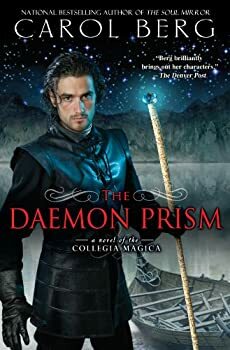 The Daemon Prism brings to a close the first three books in Carol Berg’s COLLEGIA MAGICA series. I say “the first three” because there are enough dangling threads — a new form of magic, a royal baby about to be born — to support more stories in this world if Berg wants to write them. The primary quest, however, is resolved. The Song of the Beast — (2003) Publisher: Brutal imprisonment has broken Aidan McAllister. His voice is silent, his hands ruined, his music that once offered beauty and hope to war-torn Elyria destroyed. The god who nurtured his talent since boyhood has abandoned him. But no one ever told him his crime. To discover the truth, he must risk his hard-bought freedom to unlock the mind of his god and the heart of his enemy.